BANJUL (Reuters) - The political party of Gambia's President Yahya Jammeh, who lost an election last month but has refused to accept his defeat, filed a request for an injunction with the Supreme Court on Thursday aimed at blocking the swearing in of his rival. The question of whether Gambia can install opposition figure Adama Barrow as president is seen as a test case for African democracy in a region accustomed to coups and autocratic rule. Barrow, who won the poll and has received the support of the international community, has said he will go ahead with his inauguration on Dec. 19 despite Jammeh's rejection of the result. Supreme Court Chief Justice Emmanuel Fagbenle, confirmed receipt of the petition, which was filed by Edward Gomez, a lawyer for Jammeh's Alliance for Patriotic Reorientation and Construction (APRC). "It is filed today with the court registrar," said Fagbenle, who did not say when a decision on the petition might be made. Aziz Bensouda, the secretary general of the Gambia Bar Association, said an injunction would be unconstitutional. "The inauguration of the president elect should be held when Jammeh's term officially ends. The court does not have any mandate to put put an inauguration on hold," he said. The election defeat of Jammeh, a former coup leader, after 22 years of increasingly authoritarian rule was celebrated publicly across the tiny West African nation, and the incumbent initially accepted the result. However, in a U-turn a week later that drew international condemnation, he denounced what he claimed was widespread fraud. The APRC filed a challenge to the poll results, but the Supreme Court was unable to hear the petition on Tuesday after several judges failed to show up. Fagbenle adjourned the hearing until Jan. 16. The Supreme Court, which rights campaigners say is heavily influenced by Jammeh, has not sat in over a year. Two chief justices have been dismissed since 2013. One of them was jailed. The court hired four foreign judges from Nigeria and Sierra Leone to hear Jammeh's appeal. 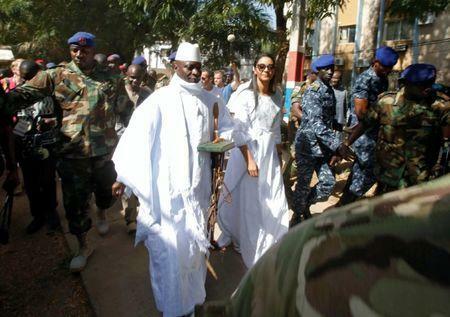 Legal sources said this week that the judges had not yet arrived in Gambia. Regional bloc ECOWAS has sought to negotiate Jammeh's peaceful departure but has also threatened possible military action if he stays on beyond the end of his term in office next week. An ECOWAS mediation mission is due to arrive in Gambia on Friday.